Now you’ve invested in cryptocurrencies, you need an app to track prices and manage your portfolio. There are plenty of Cryptocurrency portfolio management tools available, but we’ve narrowed the choice down to the best two options. 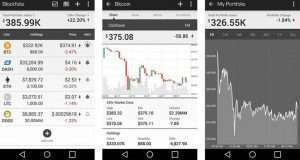 Blockfolio has been getting most of the plaudits in crypto app reviews and is the most popular choice among traders and investors. Delta is a fairly new rival, and although it hasn’t had much airing among commentators yet, does boast of being the most advanced mobile cryptocurrency management app to date. So without further ado, let the battle commence. This is our in the Blockfolio v Delta comparison review. Blockfolio has been stealing the plaudits from the cryptocurrency community. The mobile-only app has a slick user-interface, provides an overview of live prices and makes it easy to manage your cryptocurrency from your mobile device. Considering Blockfolio is free, you will be pleased to know the app is void of aggressive advertising – which is unusual for free mobile apps of any kind. As a result, users can navigate the app without interruption, obstacles or annoyance. Furthermore, the intuitive navigation ecosystem makes this app very easy to use. You can even toggle between Bitcoin value and fiat price at the press of a button. And because the app supports more than 800 cryptocurrencies, you should always be able to get the latest prices. One of the apps most distinguishing features is the price notifications. You can adjust the settings to alert you when your coins hit a certain dollar amount. So if a coin is losing value you will be alerted and can take relevant action. The only drawback here is when you have a bunch of coins to manage. The app alert works okay for investors with two or three tokens, but any more than that gives you too many alerts and can be fiddly to handle multiple trades every week. Logging purchases and sales are managed in the “Holdings” section. Once this has been set up, a summary appears at the top of the screen so you can keep track of profits and losses at a glance. You also have access to charts and order books for all digital currencies supported by the app. Another useful feature is the “News” section which enables you to keep track of the latest developments in the cryptocurrency sphere. If you know what to look out for, this is a great feature that prompts you to buy and sell your holdings. The default settings on the app are preloaded to give you news published by Coindesk, Bitcoin Magazine and a few others, but does have a customisable option to add any RSS feed you prefer. External pages also load pretty quickly and provide a nice user experience. One of the most impressive aspects of Blockfolio is their customer support team. The cryptocurrency space is notorious for having a low standard of customer relations support, and given Blockfolio is a free app, you wouldn’t ordinarily expect much. On the contrary, they are quick to respond and their transparency is highly credible. The one negative with Blockfolio is that it reports your customer data and trading activities to third parties – probably the government and multinational corporations – which some users may not be comfortable with. Delta is a relatively new app, designed and launched in late 2017 by software developers that were former users of Blockfolio. The duo was prompted to create a new management portfolio app because they felt blockfolio could be improved. As you might expect, Delta has many of the same features as Blockfolio, but most of them work better. The app is available for download from the AppStore and GooglePlay and comes with both a free version and a paid version. The basic app works as well as you can hope for. There are no in-app purchases or ads getting in the way and so far, there doesn’t appear to be any bugs. However, the product is very new and as more technologies creep into the crypto space, digital bugs become a standard issue. Early signs from the Delta app are encouraging. The interface is easy to navigate and has at-a-glance features that make it quick and easy for users to monitor and manage crypto assets. And unlike Blockfolio, Delta has better privacy measures and does not sell or share customer data with third parties. Delta supports every cryptocurrency on the market. There are over 2000 preloaded into the app by default, and the tool also features an add button to accommodate new cryptocurrencies that emerge on the market. The navigation ecosystem makes the app easy to use and gives users overviews of prices of the funds in your portfolio. You can see data on the entirety of your portfolio, but each coin also has a dedicated page where you can check the history of profits and losses on each coin you own. Furthermore, you can set alerts to notify you of price changes for each of the coins you have invested in. This comes in useful for when a coin is losing value, and when a coin is doing well and earns you enough to sell some of it off and convert your digital assets to fiat currency. Although the free version of Delta works well and does most things you need it to, there is also an upgraded version which you can purchase for a mere $3.99. Given Delta has no funding and does not sell customer data, we think the developers deserve a token gesture for producing a user-friendly app that protects you from corporate scrutiny. Delta and Blockfolio are the most advanced portfolio cryptocurrency tracker tools currently available on the market. If you have any other suggestions, we’d love to hear from you so feel free to leave a comment below. For more information read our article on Delta Cryptocurrency Portfolio.